The St. Linus Athletic Club (SLAC) provides a combined competitive and instructional athletic program as an extension of the St. Linus School academic program. Student participants will learn the fundamentals of each sport and be given the opportunity to develop strong, healthy and disciplined minds and bodies. Participants will also develop a sense of good sportsmanship, fair play and team spirit. 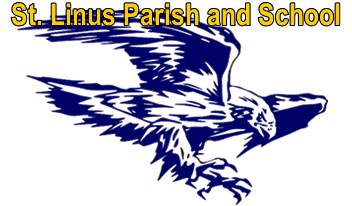 CLICK HERE for St. Linus School Website - CLICK HERE for the St. Linus Parish Website. Admission Tickets are available online for $55 per person through November 7, 2018, or $60 per person at the door. Purchase of a Sponsorship Ad within our 2018 Sports Night Ad Book. Half page ad: $100 (7x5 horizontal). Full page ad: $150 (8x10 horizontal). Front or back page of ad book: $300 (8x10 vertical). Wall sponsor 2018-2020: $400 (24x24 wall sign plus full page ad for 2018 book). Beverage Sponsor or Dinner Sponsor: $500. Deadline for ads is November 2, 2018. PDFS and / or JPEGS for ads are to be emailed to Ed James at jed46@yahoo.com and Tom Boland at boland06@gmail.com. OR PAY ONLY NOW by using the respective Sponsorship button below! This form is to be submitted after your player has suffered a concussion and has medical clearance to play sports again. Please submit this form to the SLAC box at the rectory. It is mandatory for all coaches and assistant coaches to complete this training and turn in certificates to their coordinators. All others are welcome to complete training. Please complete and submit your certificate to stlinusathleticclub@gmail.com or to mhayes@stlinusschool.org or to the St. Linus school office or rectory. Please note that ALL current fees and any past balances must be paid BEFORE Sacraments are received and FULL payment made before participation on ANY St. Linus Athletic Team(s).